Treatment starts after careful examination from the doctors. And the requirements differ from doctor to doctor. The lookout of a general physician is different than that of a dentist. 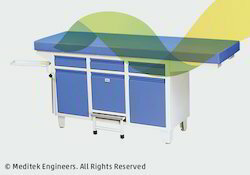 This series of efficient couches & tables offer them the ease of operations they need. 75mm thick high-density foam upholstered top in two sections. Height and backrest adjustable on electric actuators through wired hand control. Provided with drawers which can be opened from both sides of the couch for easy accessibility and paper roll holder at the foot end of the couch. Chemically pre-treated and polyester epoxy powder coating finish. 75mm thick high density foam upholstered top in three sections. 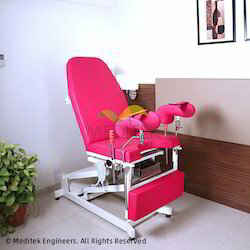 Height, backrest and pelvic tilt adjustable on electric actuators through wired hand control. 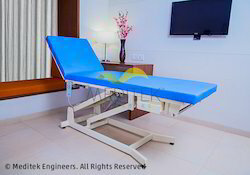 Provided with a pair of Lithotomy crutches and stainless steel hand grips. Provided with paper roll holder. Features B.P. 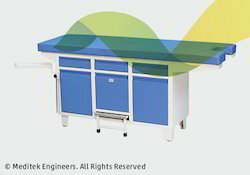 apparatus tray. Pre treated and powder coated. 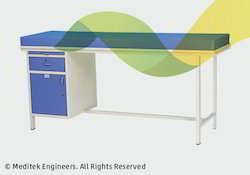 Overall Approximate dimension : 1940mm L x 600mm W x 850mm H.
CRCA rectangular tube frame with CRCA sheet cabinets. Fixed upholstered top in two section. Headrest adjustable on gas spring. Three cabinets and three drawers. Pre treated and powder coated. Features Fixed upholstered top. Retractable step stool. 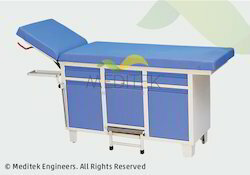 Overall Approximate dimension : 1840mm L x 600mm W x 850mm H.
Features Provided with examination trolley with 3 trays Pre treated and powder coated. One drawer and one cabinet. Looking for Examination Support ?